In recent years, Red Sea archaeology has been the subject of renewed interest by archaeologists, anthropologists, and linguists. The Erythraean (Red Sea) trade represents long distance maritime trade between Roman Egypt, Africa, Arabia, and India. Numerous classical accounts of this trade, such as Indicopleustes, Periplus Maris Erythraei; Strabo, and Pliny the Elder, have motivated many to focus on the ancient economy. 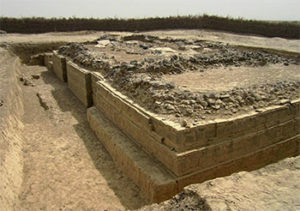 The first mentions of Adulis date back to the 1st century AD. Pliny the Elder, when describing the eastern coast of Africa, mentions an oppidum Aduliton (Natural History, 6.34). He also offers an etymological explanation for the name of the settlement, mistakenly relating the name “Adulis” to the Greek word for slave (doulos), and therefore assuming the city to have been founded by escaped Egyptian slaves (“Aegyptiorum hoc servi profugi adominis condidere”). The importance of the site in international trade is also clearly attested to by Pliny the Elder when he defines Adulis as the most important emporium for the people of Trogodytica and Aethiopia (“maximum hic emporium Trogodytarum, etiam Aethiopum”). Not surprisingly, the Periplus of the Red Sea also refers to the settlement as an emporium, mainly for the ivory, obsidian, and turtle shells (PME, 4-5). Cosmas Indicopleustes, whose Topographia Christiana is dated to the 6th century AD was another author from late antiquity who recorded two inscriptions he observed in Adulis during his days. The first one, dated to the age of Ptolemy III the Euergetes (247 – 222 BC), states that the Hellenistic ruler used to capture wild elephants in the region of Adulis to supply his army. The second is better known as the Monumentum Adulitanum. According to Cosmas, it was inscribed in the 27th year of an unnamed king, reporting his victories. Unfortunately, since the name of the ruler is not provided by Cosmas, one cannot date the inscription, not even approximately. Similarly, Byzantine sources dating from the 4th to 8th century AD provide some useful accounts of how political changes influenced trade routes over the 3rd century AD and the emergence of certain groups as major political units in the Red Sea world.